Published: Sept. 22, 2016 at 07:29 p.m. Updated: Sept. 23, 2016 at 10:46 a.m. Here we'll look where cornerbacks and wide receivers line up, which defenses are particularly susceptible to which player packages and so much more in order to find value with our fantasy players. As the season goes along we'll have even more data to use and a better understanding of the Next Gen Stats. Here are the top matchups that could bring value in Week 3. Around the NFL writer Chris Wesseling wrote a piece this week ranking the top slot receivers in the NFL today. While the inspiration of the piece was the fast emergence of Giants rookie slot maven Sterling Shepard, one of Wesseling's primary conclusions ended up being that there is no longer such a prototype for the slot receiver. In years past, common knowledge held up the Wes Welker-type players as the only brand of receiver that played inside in the slot. However, that's changed in recent years with teams using a multitude of receivers in slot, particularly players with size. From a schematic, on-field standpoint, the concept makes complete sense. Teams move their bigger receivers into the slot to earn an advantage over the typically smaller cornerbacks who play inside on nickel packages. Fantasy owners also need to start monitoring this trend as a number of these players are producing at increased statistical clips. Thus far in 2016, Decker took 53 percent of his snaps from the slot, which is actually down from 62 percent of in 2015, and accumulated 66 percent of his yards from inside. 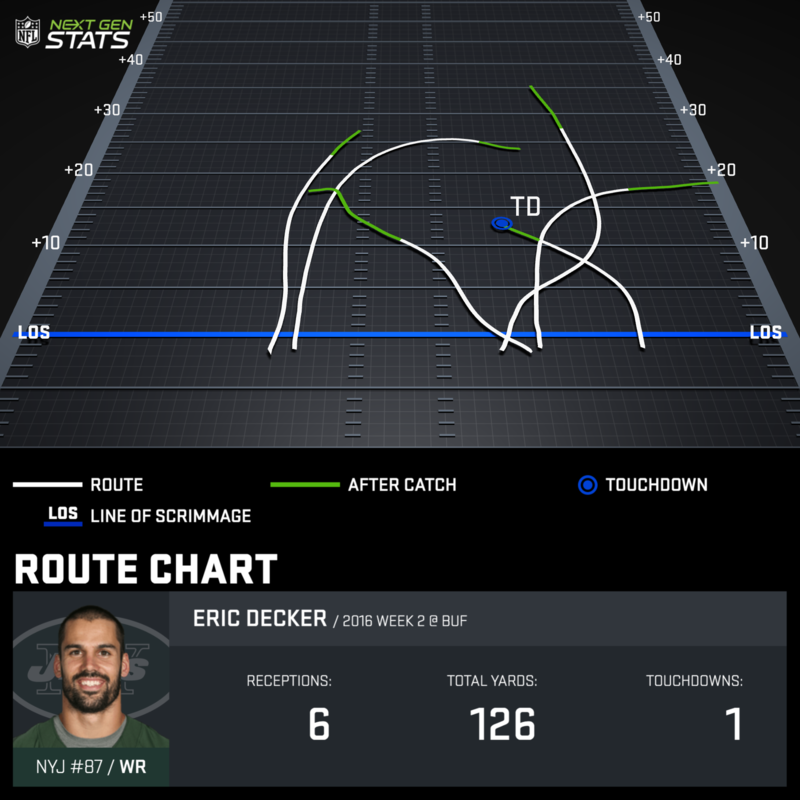 Decker's route chart from Week 2 shows the advantage he holds running those in-breaking deep post and crossing routes at 6-foot-3 and 200-plus lbs against smaller defensive backs. Larry Fitzgerald moved to the slot after Bruce Arians came over as the head coach and crafted a new role for him. In 2015 Fitzgerald took 49 percent of his snaps from the slot and that number has gone up this year with 60 percent of his 2016 snaps coming from the inside thus far. 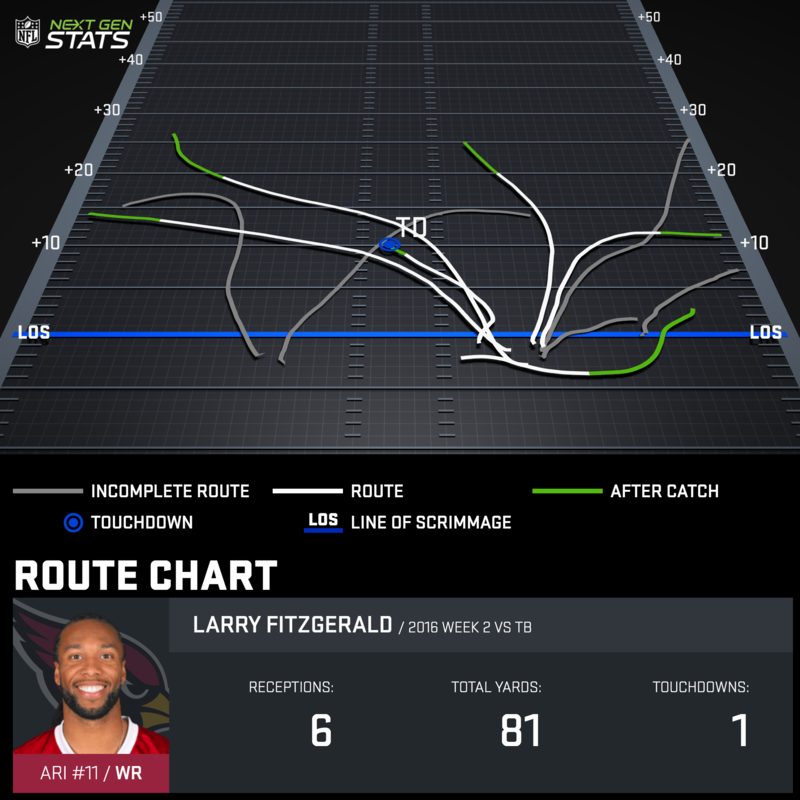 The Next Gen Stats route chart illustrates the simplification of Fitzgerald's route portfolio in this slot receiver role. While he'll still occasionally mix in out-breaking patterns, the vast majority of his targerts come on slot or drag routes to the middle of the field. The veteran's ability to sift through traffic and flash open on these routes gives the deep shot-based Cardinals offense a reliable target to move the chains. It also makes Fitzgerald a particularly effective red zone weapon, and he leads the NFL in targets and touchdowns inside the 10-yard line through two games. Several other big slot receivers look to be breaking through as major fantasy contributors thus far in 2016. Quincy Enunwa (6-foot-2, 225 lbs) looks like a surprising breakout candidate after catching 93 percent of his targets this year for 146 yards and a touchdown on way to a WR20 ranking. Enunwa took 59 percent of his snaps at slot receiver and 12 percent at tight end in a hybrid middle of the field weapon role through two weeks. Perennially underappreciated Jordan Matthews is proving doubters wrong as he sits as the WR16 in fantasy right now and tied for second in the NFL in wide receiver targets. Matthews' slot snaps are down to 46 percent from 87 percent in 2015, proving he's not as limited as many imagined, but he's still collected the majority of his yards (63 percent) from the interior. Mohamed Sanu had a down Week 2, but showed his potential in Week 1 with 80 yards and a score. The Falcons deployed him in the slot on 48 percent of his snaps so far. Some teams are even using traditional top wide receivers with size in the slot on occasion to design favorable matchups. Kelvin Benjamin has only taken 14 percent of his snaps in the slot, but he's accrued 37 percent of his yardage and two of his three touchdowns there. Allen Robinson hasn't exploded yet in 2016, but the team is working to move him around to use his size and proficiency as a route-runner in the middle of the field. His slot snaps are up from 13 percent in 2015 to 27 percent this season and he's racked up 37 percent of his yards there. Donte Moncrief (now injured) and Michael Crabtree aren't far off from their team's top receivers in terms of target share, and they took 25 and 26 percent of their snaps from the slot in the first two games. All told, it looks like big receivers being deployed from the slot is a new trend that offenses are using to amass production and move down the field. Not only should this help us change our expectations of what a slot receiver is or is not, but it should also remove the label as a pejorative term. Additionally, fantasy owners should take notice. Having this knowledge can not only help make lineup decisions based on weekly matchups, but also help target sleepers that might find themselves in this role. Right now there are a few receivers with decent size and taking a healthy amount of snaps in the slot, but just don't have a ton of opportunity on their plate. Bengals rookie Tyler Boyd (6-foot-1, 197 lbs) spent 91 percent of his snaps in the slot and accrued all of his production there. Veteran Anquan Boldin (6-foot-1, 218 lbs) took the slot role from Golden Tate in Detroit lining up inside on 81 percent of his snaps. Sleeper Raiders receiver Seth Roberts (6-foot-2, 196 lbs) flashed potential in his brief pro career and lined up in the slot for 59 percent of his snaps this year. If injuries or another change in the distribution occurs to the players ahead of them, players of this ilk could produce to the degree that some of the other big slot receivers have in recent years. Keep an eye on them. 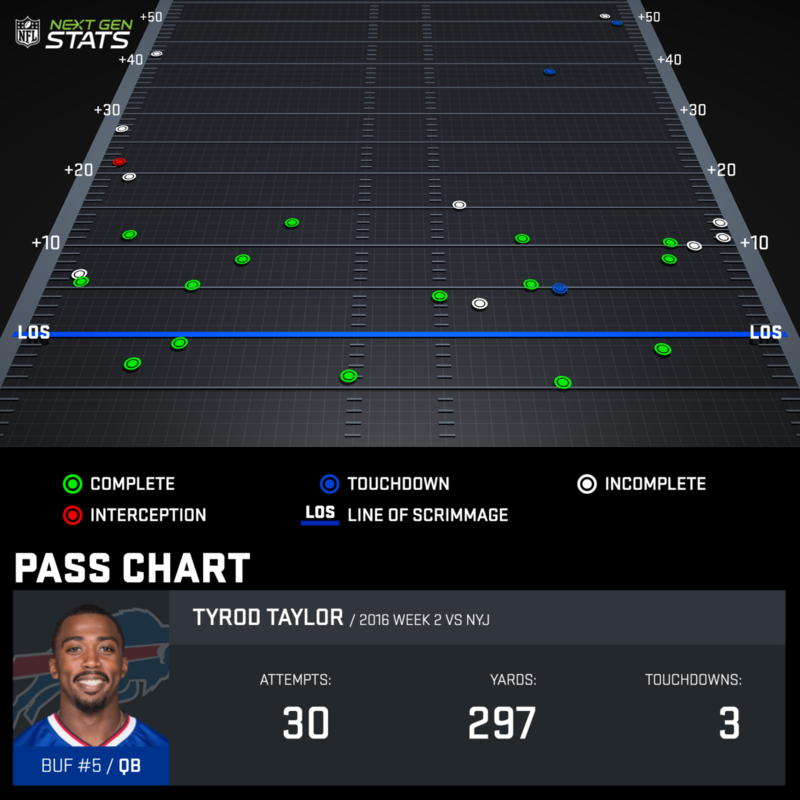 Other than passes behind the line of scrimmage, Taylor completed just one pass within five yards of the line. We saw the upside of this deep shot approach, as Taylor hit his two long bombs and enjoyed a massive fantasy outing. However, there's a bit of a "live by the sword, die by the sword" debate here, as the Bills couldn't truly sustain an offensive drive, losing the time of possession battle 39:12 to 20:48. Additionally, these deep shots take longer to develop. Tyrod Taylor's average time to throw is 3.05 seconds this season, which is the longest in the NFL thus far. Holding the ball so long, whether waiting for deep plays to come open or just through scrambling, leaves Taylor open to taking sacks or throwing interceptable balls. That's a bad recipe when facing Arizona. The Cardinals defense blitzed on 42.2 percent of pass plays run against them this season, which is the most in NFL. We saw a quick-strike offense in New England be able to mitigate the pressure Arizona brings in Week 1, but then watched the next week as another deep passing offense led by Jameis Winston turn the ball over five times. Despite the fact he's coming off a rather deceiving 24-point fantasy outing, this makes a good week to fade Tyrod Taylor. With how long Buffalo asks him to hold the ball going against a blitz happy team, we could be in for a multi-sack and/or turnover outing. Do make sure to watch whether new offensive coordinator Anthony Lynn changes up the play-calling, however. Thus far this season, Jeremy Maclin has been merely a solid WR3 in fantasy, amassing just 11 receptions on 22 targets for 131 yards and a single score. Last week in particular he didn't get much going totaling just 68 yards despite leading the NFL in targets for Week 2 with 15. Week 3 sets up as a strong spot for Maclin to approach more of his ceiling. The Chiefs welcome the Jets to the Arrowhead Stadium in a game that could be sneaky high scoring. Maclin may square off with Darrelle Revis, who has been a major talking point for all the wrong reasons this season. He let up 10 catches and over 150 yards with a score to A.J. Green in coverage in Week 1 and got burned by Marquise Goodwin for an 84-yard touchdown in Week 2. It certainly appears Revis is no longer the shutdown corner he used to be, and the Jets may well have reacted to that in Week 2. After tracking A.J. Green across the field in their season opener, Revis did not shadow Watkins in Week 2. 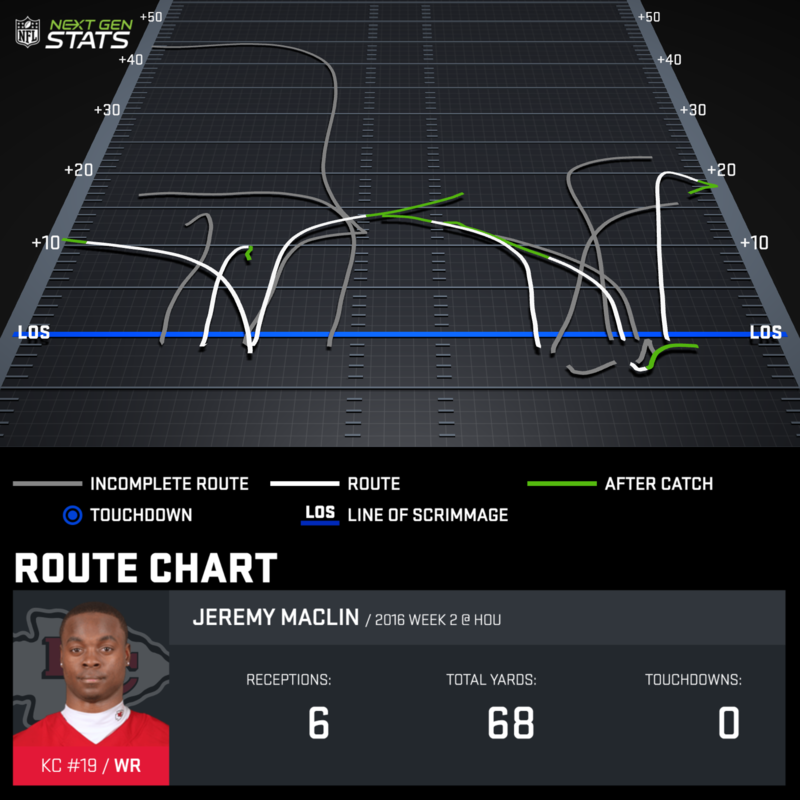 Maclin accrued 52 percent of his yards from left wideout, 22 percent at right and 26 percent from the last through two games. If the Jets stick Revis at left corner again, Maclin has a good chance of avoiding his coverage for the vast majority of his snaps. If Revis shadows Maclin, nothing through the first two indicates that's a matchup to avoid. Maclin has a strong chance to crack 100 yards for the first time in 2016, especially with the Jets offense looking in-sync and the Chiefs needing to chase points. It's the matchup everyone is talking about this week: Josh Norman vs. Odell Beckham. Last year we know it became a big story in Week 15 as the two engaged in physical play that went way too far, resulting in an NFL rule change. The contest also featured two of the NFL's best at their position engaging in the ultimate one-on-one matchup. Now that Beckham and Norman are division rivals, we will see them square off twice a year. It sounds like Washington figured out quick that the corner they paid top dollar for ought to follow the best receiver around the field. A source told ESPN's Britt McHenry that in Week 3 Norman will go "anywhere Odell goes ... except for slot." All indications are that Beckham and Norman will indeed face-off plenty of times; get ready for the show. The question remains: who holds the edge? There's no question Norman got into Beckham's head, causing the young wideout to make mistakes and draw a number of flags and likely enough to warrant an ejection that never came. With that being said, the one-on-one matchup didn't leave us with as much of a clear victor. Norman 100 percent did not shut down Beckham. Odell had 2.5 yards of separation on Norman in coverage when he dropped a would-be 52-yard touchdown early in the game. Once Beckham finally clicked mentally, he destroyed Norman in the second half, including on a red zone touchdown where he streaked past Norman, earning 2.72 yards of separation at the moment of the catch in the end zone. He also beat Norman on one of his patented comeback routes in the fourth quarter for an eight-yard gain, but left the cornerback behind with 1.84 yards of separation. 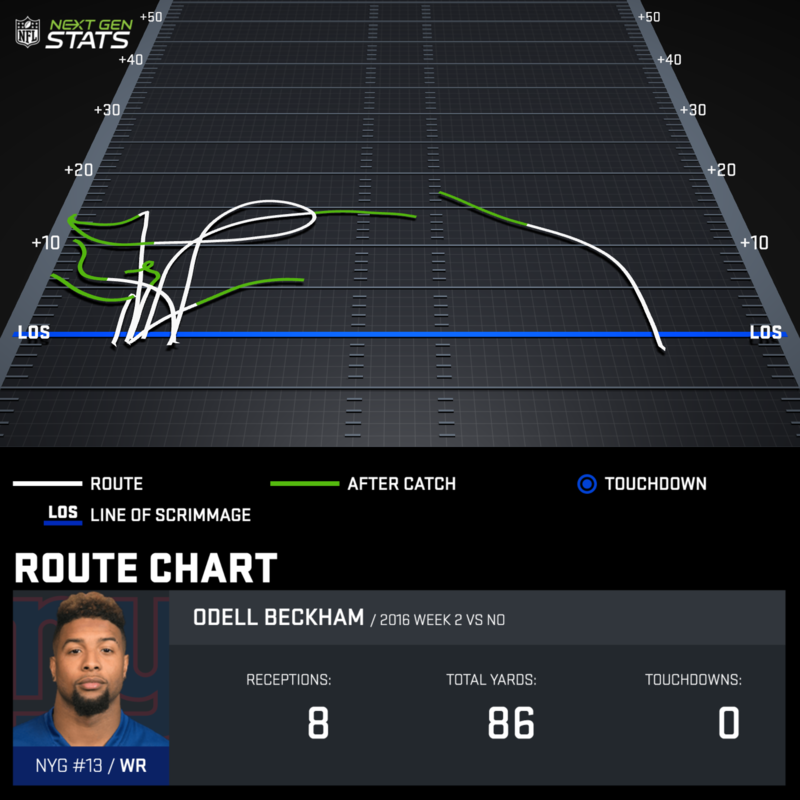 From a pure player perspective, Next Gen Stats reveal that Odell Beckham should still have an advantage over Josh Norman when they line up across from each other, which should be quite often. The mental side of the game will determine who wins this matchup, but either way, bet on this being must-see TV. One preseason reality that carried over into the real games is that Tajae Sharpe is indeed the No. 1 receiver in Tennessee. He leads all Titans receivers in snap percentage and targets through two weeks. While he hasn't turned that opportunity into a massive contest just yet, this could be the week it happens. Wide receivers lining up opposite Smith on the offensive left side have just gone off against the Raiders. Brandin Cooks gathered 101 yards lined up at left wideout in Week 1, including a 98-yard score over Smith that earned the corner a benching. Michael Thomas also collected 38 yards at left wideout and Willie Snead another 62 yards and a touchdown. The problems didn't stop in Week 2, as Julio Jones killed when lining up at left wide receiver, racking up 97 yards and a touchdown where he had 2.12 yards of separation on Smith on a deep streaking route across the middle. Tajae Sharpe took 51 percent of his snaps and collected 70 percent of his yards through the first two weeks at left wide receiver. Smith struggled against a small receiver in Week 1 and a big wideout in Week 2. Sharpe isn't the talent that Cooks or Jones is, but he has the route running acumen to deceive Smith on more than one occasion this Sunday. Matt Ryan had an abysmal first year in Kyle Shanahan's offense in 2015, but he's in the middle of a nice bounce back campaign. He looks like he fits with what Shanahan wants in his quarterbacks far more than he did in his first year in the system. 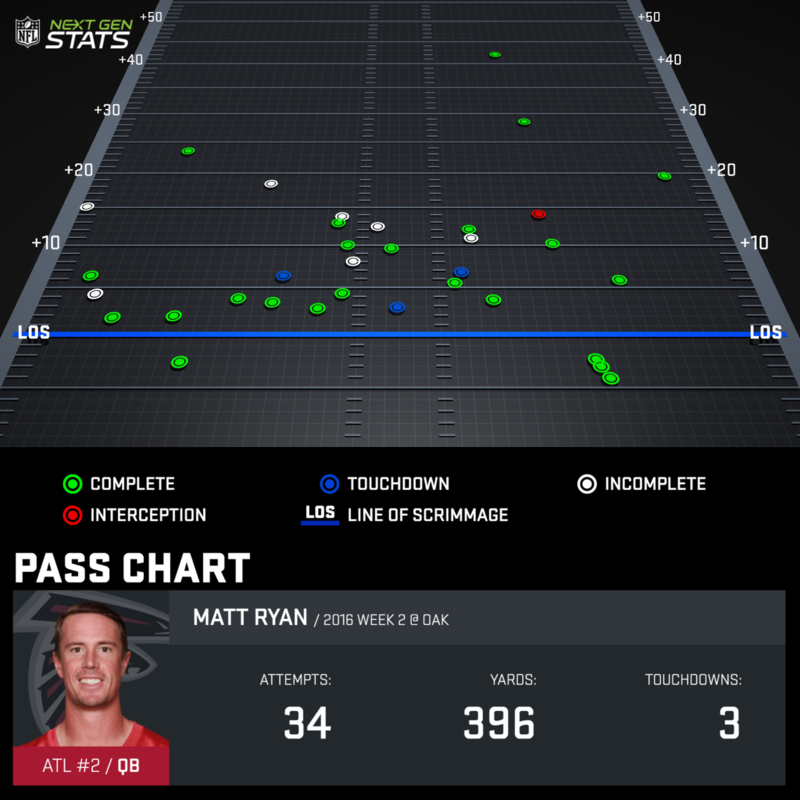 In Week 2, Matt Ryan posted a 137.5 passer rating when he was blitzed, and faced 14 blitz attempts on Sunday. He doesn't look as rattled or as uncomfortable as he did in 2015. Ryan attempted a pass outside of the pocket on 15.2 percent of his throws in Week 2, the fifth highest in the NFL. He completed 60 percent of those passes. Ryan's biggest issue in transition to Shanahan's offense was dealing with all of the bootlegs. That no longer seems to be an issue. Ryan rarely went outside the numbers or down the field. The emergence of team target leader (for real) Jacob Tamme into a reliable threat and the addition of Mohamed Sanu opens up the short area of the field for trustworthy targets far more than in 2015. His production in the first two weeks came all while Julio Jones played at less than 100 percent. Matt Ryan can absolutely take advantage of an under-manned Saints secondary who is now down its two veteran starters and resorting to undrafted and street free agents. With how strong he appears to be in the roll-out infused and short-area passing attack of Kyle Shanahan, Ryan looks like a top-12 quarterback once again. 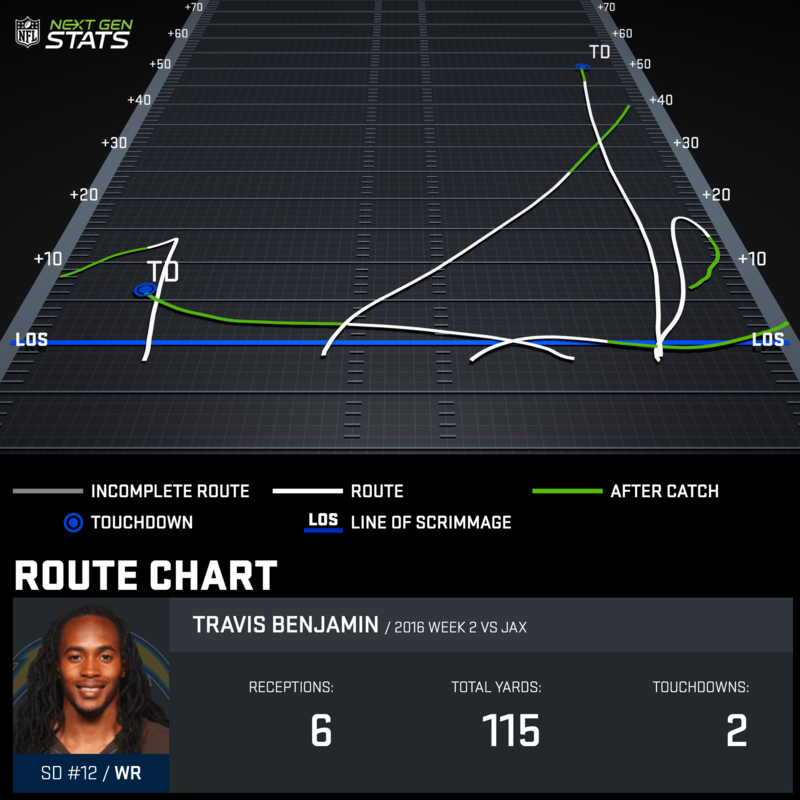 As you can see from his chart, Benjamin hauled in a go-route for a touchdown against the Jaguars. We know he's good at that. However, he also caught his red zone touchdown and another long ball on slant patterns. Most impressively, two of his other receptions came on nuanced comeback routes, a pattern than Benjamin is surprisingly proficient at creating separation on. While he doesn't profile as the ideal No. 1, Benjamin is showing in his second career stop that he's capable of stepping up to the task when needed. He's far more than just a deep route runner. Benjamin gets another strong matchup in Week 3 against a Colts defense running out their backup cornerbacks to remind the world what he can do. The Colts' top corner, Vontae Davis, could return which would give Benjamin a tougher task. Either way, he's looking like an every-week play in fantasy right now with a high floor and ceiling.